Through such API you may execute queries, by providing the expected parameters to the corresponding URL. In this article a simple example will guide you through this specific feature. Then you may perform a call to https://[your_server]/[your_project]/odata/data/queries([ID_query])/executeQuery sending in the body the query parameters you want to use to perform the query. The request should be executed as shown in the image below. 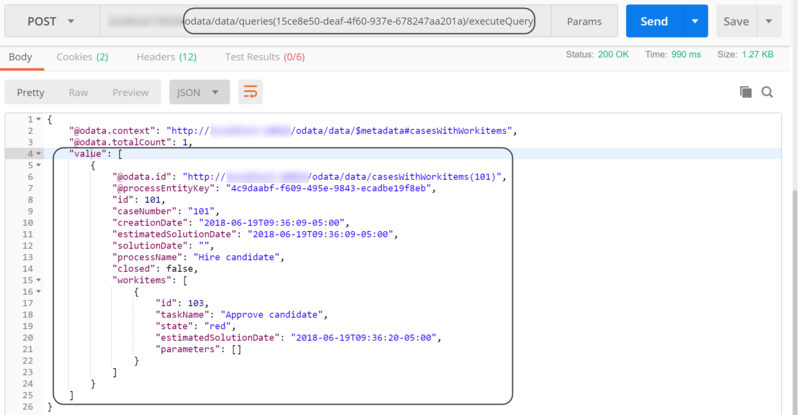 The query above, receives as input a CandidateName which belongs to the HireCandidate process entity, so the Xpath is specified in the syntax shown. On the "value" parameter, you are free to send any value you would like to query for. 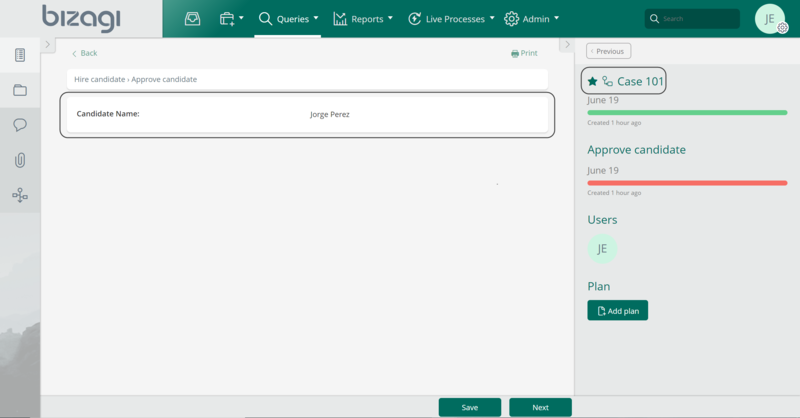 Bizagi will perform the query as it was being done via the Work Portal, and it will respond with the results of the query as it is shown in the following image. As it can be seen, the response includes the total number of records found under the "@odata.totalCount" field. After that general information, under the "values" object, you can find the detail of the query's result. In this case it shows the case #101, which satisfies the condition given: It's CandidateName is Jorge, as shown in the image below. There might be situations where you might need to use the same control twice in a single Query Form. For example, you might want to find those cases created between two CreationDates. In those cases, to enhance your own understanding and help Bizagi identify to which of those parameters you are referring to, you have to use the searchType attribute for those Query parameters. You can obtain the searchType needed by performing an invocation of the https://[your_server]/[your_project]/odata/data/queries([ID_query])/parameters service.